Apple Cider Vinegar is nature’s magic potion. I am sure you would have already heard about some of its benefits. You will be surprised to know that, It is in use way back from 1958, from the time doctor D.C. Jarvis wrote a book praising Apple Cider Vinegar’s benefits in treating everything from arthritis to diabetes to weight gain. Apple cider vinegar is a type of vinegar made by the fermentation of apple cider. During the fermentation process, sugar in the apple cider is broken down by bacteria and yeast into alcohol and then into vinegar. Like many types of vinegar, apple cider vinegar contains a substance called acetic acid. Apple cider vinegar also contains some lactic, citric and malic acids. Is Raw Apple Cider Vinegar Better than Clear Vinegar? Raw, unfiltered and unpasteurized vinegar with floating stuff inside alone can be used as a health tonic. The floating matter is not dirt, but a substance called as “mother” which is formed from pectin and apple residue. The minerals, amino acids and vitamins present in it, gives it a brown tinge. Healthkart’s Apple Cider Vinegar comes with the ‘mother’ culture in it which contains beneficial bacteria and acids that helps you keep fit and healthy. What’s Good About Apple Cider Vinegar? Research studies suggests that drinking apple cider vinegar can help to burn fat and lose weight. Acetic acid, key ingredient found in apple cider vinegar, helps with weight loss. A study carried out in 175 Japanese people in 2009, showed that continuous vinegar intake reduces body weight, BMI, and body fat mass. Apple Cider Vinegar also gives a feeling of fullness, because of which food intake reduces. Research suggest that intake of small amount of apple cider vinegar can help to reduce blood sugar levels after a peak following a meal high in carbohydrates. Apple Cider Vinegar is very much beneficial for Type II Diabetes patients in managing their blood sugar level. Acetic acid present in apple cider vinegar slows down the conversion of complex carbohydrates into sugar in the bloodstream. Apple cider vinegar, or ACV can lower even blood pressure when consumed daily. It brings about better blood circulation by breaking down fat and phlegm deposits in the body and lowers pressure against the arterial walls. Apple cider vinegar increases good cholesterol levels and decreases bad cholesterol. ACV reduces LDLs also known as “bad” cholesterol, which oxidizes in the blood stream and lead to the formation of plaque. Flavonoids in ACV scavenges free radicals and prevent cell damage and oxidative stress, reducing the risk of atherosclerosis. Many people with gout found instant relief after consuming apple cider vinegar, while others have reported relief after a few days. Apple cider vinegar breaks down uric acid crystals and prevents them from reforming in the joints. It also reduces inflammation and swelling in the joints giving it more flexibility. If you are down with diarrhea caused by bacteria, Apple Cider Vinegar could be the best remedy as it has anti-bacterial properties. Apple cider vinegar can also be used to treat stomach pains and muscle cramps, in the place of antacids. Apple cider vinegar is rich with probiotic compounds too, which promotes the growth of healthy intestinal bacteria. Apple Cider Vinegar has antibacterial properties, which helps to keep acne under control. The malic acid and lactic acids found in apple cider vinegar is good to exfoliate skin, reduce red spots, and balancing skin pH. Hollywood star Scarlett Johansson uses apple cider vinegar toner to keep her skin smooth. Hiccup is often considered as minor inconvenience by many, but for some people it’s a serious problem. The sour taste of apple cider vinegar distracts the mind, and thus stops the hiccups. Apple cider vinegar is one of the best remedies to clear nasal congestion. It contains potassium, which helps in thinning the mucous. Organic ACV is also loaded with antioxidants and has anti-histamine and anti-inflammatory properties, which helps to alleviate symptoms of cold. 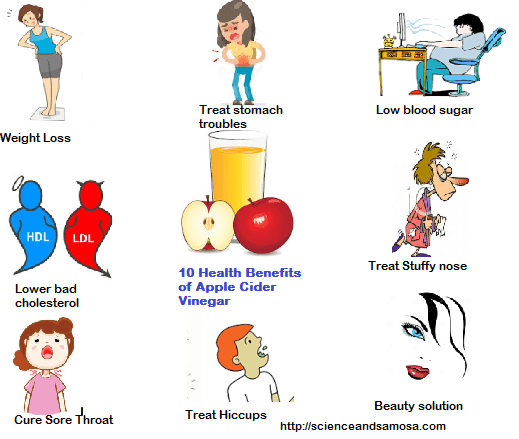 Acetic acid present in Apple cider vinegar kills bacteria and prevents it from multiplying and reaching harmful levels. Combine apple cider vinegar with warm water and gargle at regular intervals. 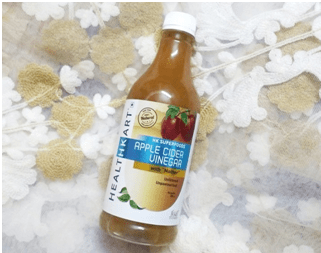 Where to buy apple cider vinegar from ? Apple cider vinegar is no longer a foreign product. 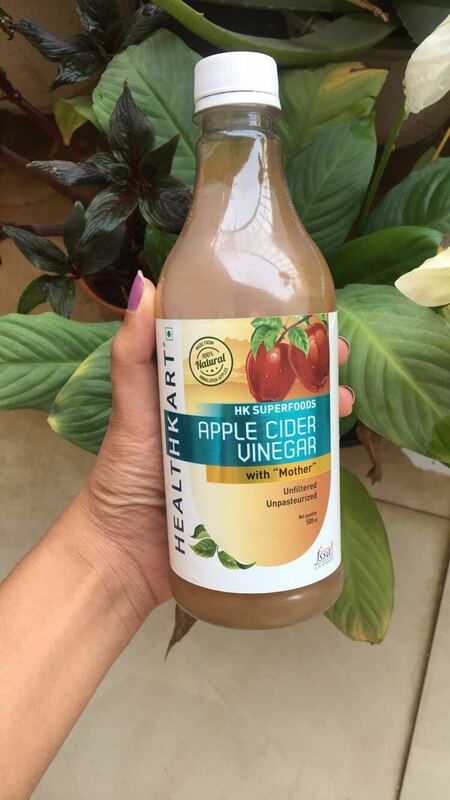 You can buy Healthkart’s Apple Cider Vinegar with ‘Mother’ made from Himalayan apples from healthkart.com. The product is completely natural and is made using good quality ingredients. The best thing about Healthkart Apple Cider Vinegar with Mother is that it is available in different flavours with honey or ginger, garlic, lemon, Garcinia and Green Coffee or Cumin, Fennel, Carom Seeds. The product comes in 0.25L, 0.5L and 1L bottles. Since it is a Healthkart product, you can place the order online and they will deliver it at home. Is it safe to drink apple cider vinegar? Consuming apple cider vinegar in small amounts is widely regarded as safe, whereas in large doses it can irritate the stomach and cause low potassium levels. Can you drink apple cider vinegar straight? Very informative post. I use it for weight loss but didn’t know it has so many additional benefits. I didn’t know Apple cider vinegar had so many benefits. Thanks for sharing.